Buy a lightweight entry-level laptop for the road and it’s likely to ship with a small drive. A 128GB SSD is often the norm and you’ll soon find yourself battling the system for storage space. Using the cloud is one option, keeping files away from your computer and downloading on demand. Realistically though, how much space would these use and you’ll require a solid internet connection just to be able to access the data. Not always ideal away from the office. Another option is to use a tool designed to check over your system and remove unnecessary, old and redundant files. That’s precisely the role of Auslogics Windows Slimmer, a free tool which will check, advise and enable you to remove old Windows data, update files and even bloated applications. 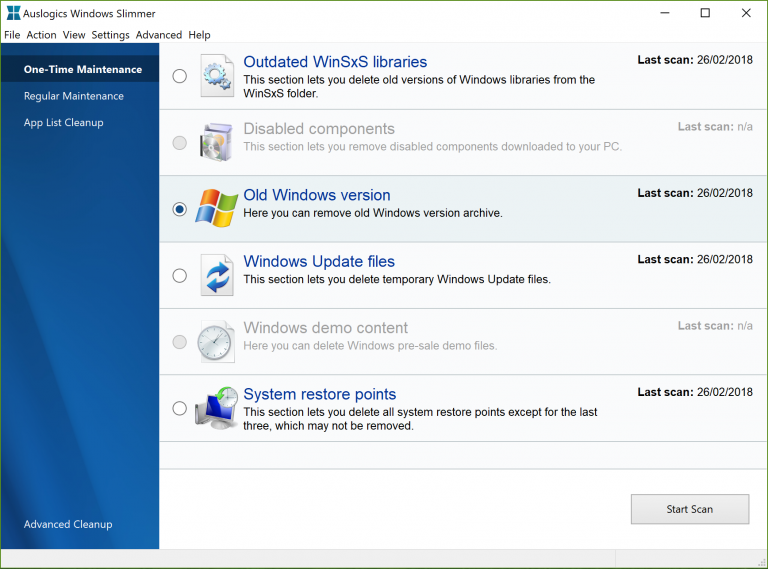 Split into three sections, the One-Time Maintenance is an area which will look for old Windows files, system restore files update data and more. We found over 3GB of data which could be safely removed. The Regular Maintenance section will find temporary files, memory dumps and application logs. Although these are all smaller files, the area still found 400MB of data which could be removed. Lastly, the App Cleanup section will list the applications installed on your PC, the amount of hard drive space they take up and whether they are trusted files or not. There’s also an "Advanced Cleanup" area which is really just a promotional section for promoting Auslogics BoostSpeed 10, which is trialware. Windows Slimmer is potentially worth downloading. Just be wary of the other tools the installer tries to add to your system during installation.